Since the beginning of the season, we’ve heard non-stop banter about brush heads, stroke angle, one-brush, two-brush, hair brush, blue brush. But what it all boils down to is scratches. Or at least that’s what we think. With the all attention to fabric and technique, there hasn’t been much time to adequately study it all in the middle of a busy season. The scratch theory is the current “best guess” to explain what we’re seeing. The new “directional sweeping” movement, as it’s being called, is the latest innovation in a sport that is constantly evolving from its stone-aged roots. With new technology came new techniques, and when the technology was questioned (and in some cases, outlawed), the techniques survived and made the best players and coaches in the world question the conventional wisdom of what we all THOUGHT sweeping did. Prior to the 2010 Olympics in Vancouver, a very scientific study taught us a few new things; the most useful of which was this: When sweeping, the ‘push’ part of your brushstroke is far more effective than your pull. 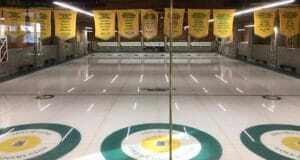 “Smartbrooms” with speed and pressure sensors measured the PSI (pounds of pressure per square inch) for all of Canada’s top sweepers, and in every case, the push part of the cycle generated higher numbers. It makes sense if you think about it. It’s difficult to put your weight on something and pull it toward you at the same time. You have to take weight off it. When the brush-head fiasco reared its ugly head in the fall of last year, the discussion moved from how much heat one could create while brushing the ice to, instead, what kind of scratches an individual was making. With extra-rigid heads, sweepers could create grooves that the rocks would follow all the way down the ice. Need it to curl? Scratch it one way. Need to straighten it out? Scratch it the other. 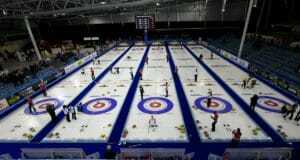 The World Curling Federation found through on-ice testing that some of these fabrics were scoring and shaving the ice so much that they damaged the playing surface, and thus they outlawed certain heads. 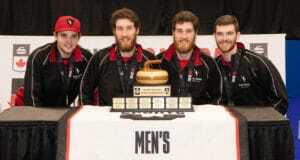 Curling Canada and several other international federations followed suit. When the offending heads were banned, the scratching theory persisted, and teams experimented with non-traditional ways to alter a rock’s path. What they found was that although the existing technology wasn’t as over-the-top effective, the theory of scratches still worked, especially with hair brushes. We’ve often heard of teams sweeping with the curl to help “finish” a rock (curl more at the end of its slide), or a skip yell “switch” when they need a little extra movement. The new convention is just applying that theory to the whole path of the stone, instead of just from the hogline in. So it breaks down like this: Teams will sweep with one traditional hair broom and one fabric pad. Depending on which turn is being thrown, the brushers will trade so that the hair broom is on the “high side” or “broom side” of the curl, i.e. the rock will curl away from him/her. The brusher on the low-side will have the fabric brush. If the rock needs to curl, the hair brusher on the high side will use his/her effective push stroke to create grooves that help the rock move that direction. If the rock is curling too much, the low-side brusher will push against the curl, to try to scratch opposite the curling action. Only one brusher will sweep at a time, because a second set of scratches from the other side would counteract the first’s efforts. When dealing with the scratch theory, one direction is better than a criss-cross. But wait, you might ask — what if you need to sweep for weight? What do scratches do then? If you need to go for weight, forget all of the above and start scrubbing; BOTH of you! 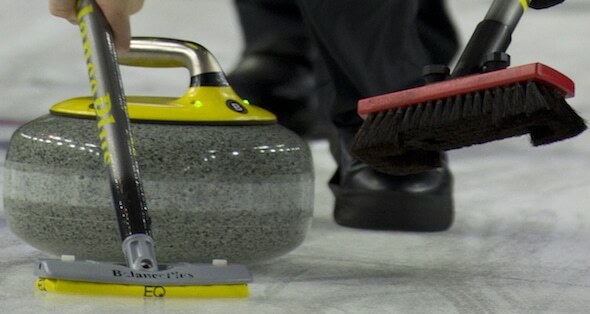 When sweeping for weight, the traditional combination of speed and pressure (from both sides) will still warm the ice a degree or two, and allow that rock to glide better. But wait — What if you need to go for weight AND line? Well … even the best teams are still working on that one!